Note: Girvin broke his maiden in his only start last year in a maiden race at the Fair Grounds. 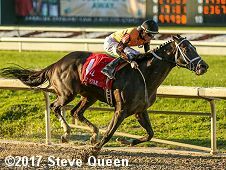 He made his 2017 debut in an overnight stakes at the Fair Grounds, finishing second. He followed that up with wins in both the Risen Star Stakes (G2) and the Louisiana Derby (G2). In the Kentucky Derby (G1) he finished 13th beaten 19 1/2 lengths as a 22-1 shot.